On 1 August 2018, the World Health Organisation (WHO) declared an outbreak of Ebola in the Democratic Republic of the Congo (DRC) after confirming four new cases in the Mangina area, in the territory of Beni, North Kivu. According to the health ministry, the latest outbreak has claimed the lives of 20 people, including two health workers. 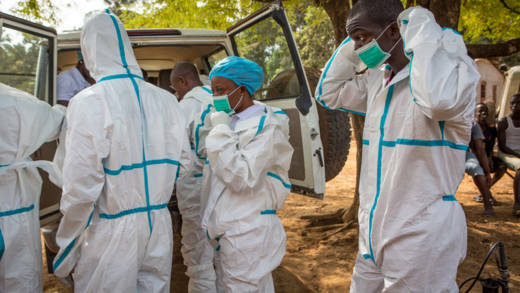 This is the tenth Ebola outbreak officially declared in DRC and comes only nine days after an outbreak in the western part of the country, in Equateur province, was officially declared over. CAFOD is already working with local partners in the area and has contacted specialists in Caritas Congo who responded to the Ebola outbreak in Equateur province. “This is the second outbreak of Ebola in DRC we have seen this year. Yet, due to the instability of the area where this outbreak is located, it has the potential to play out very differently. “Beni is an area that has been experiencing compounding humanitarian crisis’ and ongoing conflicts for many years. Thousands have been forced to flee their homes and are already at increased risk of hunger and disease. “To add an Ebola outbreak to this situation is likely to push many communities to breaking point. “CAFOD has already been able to reach out to specialists from Caritas Congo who were on the frontline in the outbreak which ended just a fortnight ago. In Beni, CAFOD’s work has already reached thousands of displaced people and host communities with food, clean and safe water and sanitation facilities. Ebola virus disease is a severe acute viral illness often characterised by the sudden onset of fever, intense weakness, muscle pain, headache and sore throat. This is followed by vomiting, diarrhoea, rash, impaired kidney and liver function, and in some cases, both internal and external bleeding. Ebola first emerged in the Democratic Republic of Congo in 1976 and it is thought to infect humans through contact with infected animals, including chimpanzees, fruit bats and forest antelope. It can then spread among humans via bodily fluids. Currently, there is only an experimental vaccine and no known cure. The most commonly used treatment is to keep the patient hydrated, as is the case with most fevers. Patients have a better chance of survival if they are diagnosed early and receive early treatment. The virus is transmitted between humans via bodily fluids, and via surfaces that a sick person has come into contact with – for example, bed sheets or shared towels. Even funeral ceremonies for Ebola victims can cause risks if mourners have direct contact with the bodies of infected people. By following a few important procedures, the spread of Ebola can usually be stopped relatively easily. Patients need to be kept in isolation, and their nurses or visitors must wear protective suits or avoid coming into direct contact with them. One reason that the virus has spread so extensively in West Africa is a widespread fear and lack of trust in the advice given on Ebola prevention. Many people don’t have access to reliable information, and high death rates and stigmatisation make people afraid to take their loved ones to hospitals, even if medical facilities are available. When was the last major Ebola outbreak? In 2015, an Ebola outbreak in West Africa claimed the lives of 11,000 people. This outbreak was so deadly as the disease had never been seen in the region before and this led to delays in identifying the nature of the problem. During the outbreak, CAFOD worked in Sierra Leone and Liberia, to raise awareness in local communities, provide safe and dignified burials and training, and distributed Outbreak Prevention Kits. Due to well-established partnerships, CAFOD was able to respond through the network of Church partners who, at the height of the disease, were able to deliver, life-saving prevention information, hygiene kits and food to quarantined and vulnerable families. Join our Emergency Response Team by giving a monthly donation so that we can respond as soon as disasters happen. Support our work in emergencies with a regular donation.